WILMINGTON, N.C. -- Coworx, a shared workspace provider, today announced the first of a series of locally-funded art shows featuring Wilmington-based talent. Organized in collaboration with Encore Magazine the opening art exhibition will showcase the creative work of Nathan Verwey, painter, poet, and artist. Verwey’s ‘Weight of Walls” series will be on display at Coworx from June through August, with 5% of artwork sales benefitting DREAMS of Wilmington, a nonprofit committed to providing youth high-quality literary, visual, multimedia, and performing arts programming. Located in the heart of The Cargo District, the art show series was created and organized by community members who work within Coworx’s shared workspace. “Coworx has supported small businesses and entrepreneurs for over seven years in the Wilmington area,” states Bryan Kristof, owner of Coworx at The Cargo District. “We’re excited to start supporting local artists at Coworx as well,” Kristof continues. Leslie Smith, developer for The Cargo District, is providing a 20-foot container for art show attendees to paint and personalize during Verwey’s show. “Our hope is guests and members will have a great time spray painting the container at Nathan’s show, then we can turn this work of art into something fun for the community, such as a podcast studio,” states Smith. 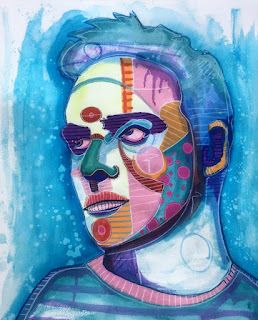 Scheduled for Friday, June 1 from 6 p.m. to 9 p.m., Verwey’s “Weight of Walls” art exhibition will feature 30 original artworks, as well as poetry and apparel for sale at Coworx from June through August. In addition to the art, live music by Jared Sales and photo opportunities by The Little Green Booth will also be provided, as well as food for sale from Joe Loves Lobster Rolls food truck. “Weight of Walls” is free to attend with complimentary beer and wine available, donated by Waterline Brewery and Mon Ame Chocolate & Wine Bar. Interested artists, vendors, and attendees can find out more by reaching out to info@cargodistrict.com. Nathan Ryan Verwey is an artist working out of Wilmington, NC, where he received his Bachelors of Arts. His style is derived from a love of art history, especially the art of the renaissance persona, as well as the street art movement. When making art, his goal is to capture the color, grit, and freedom found in street and graffiti art and bring it indoors. Visit https://www.therevolutionawaits.com/ to learn more. The Cargo District™ is an urban market and coworking village crafted from upcycled, regionally sourced shipping containers. Located in North Carolina’s ‘Port City,’ this Wilmington-based community celebrates art, innovation, and social enterprise with a cool mix of local startups and small businesses. The development also features modern container homes and eco-friendly spaces to shop, eat, and connect. To learn more, visit www.cargodistrict.com. Encore Magazine regularly covers topics pertaining to news, arts, entertainment, food, and city life in Wilmington. It also maintains schedules and listings of local events like concerts, festivals, live performance art and think-tank events. Encore Magazine is an entity of H&P Media, which also publishes Devour Magazine and AdPak Weekly. Print and online editions are updated every Wednesday. Visit http://www.encorepub.com/ to learn more.